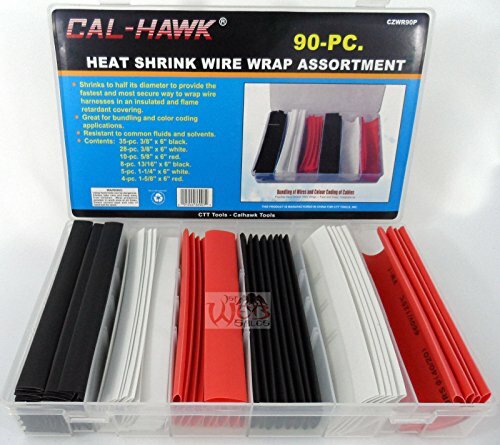 90-Pc Heat Shrink Wire Wrap Assortment. Shrinks To Half Its Diameter To Provide The Fastest And Most Secure Way To Wrap Wire Harnesses In An Insulated And Flame Retardant Covering. Great For Bundling And Color Coding Applications. Resistant To Common Fluids And Solvents. Flame Retardant Covering. Great For Bundling And Color Coding Applications. Resistant To Common Fluids And Solvents. 35pc 3/8x6" Black 28pc 3/8"x6""
White 10pc 5/8x6" Red 8pc 13/16"x6" Black 5pc 1 1/4"x6" Black 4pc 1 5/8"x6" Red"